"This is Max the Kashon at 18 months. He weighs 12 lbs. His tail almost always curves up over his back like a Bichon's. His ears are funny, one is always up and the other always down. 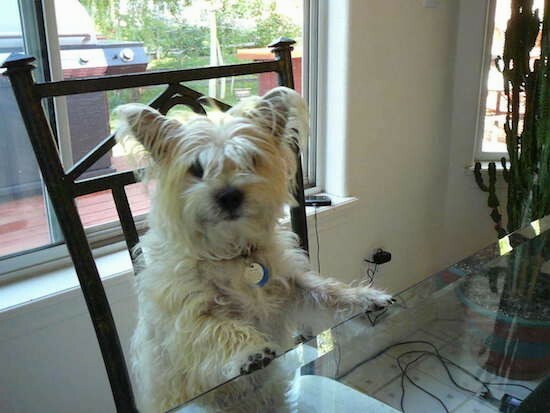 They just came that way—I guess they couldn't decide which to be, Cairn or Bichon. 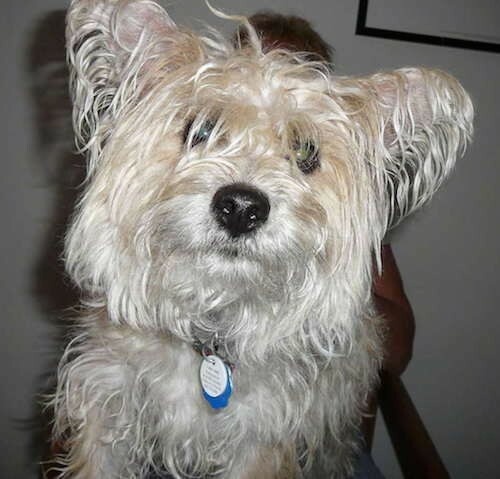 His coat is soft and silky on the front half of his body then just about where his waist would be it turns into Cairn hair, very coarse! 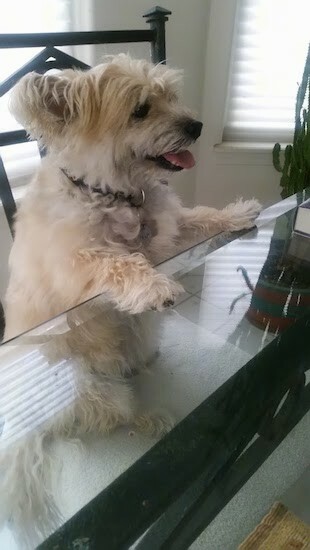 He's a terrier at heart and a perfect family dog. His temperament is sweet, loyal, playful and very energetic." The Kashon is not a purebred dog. 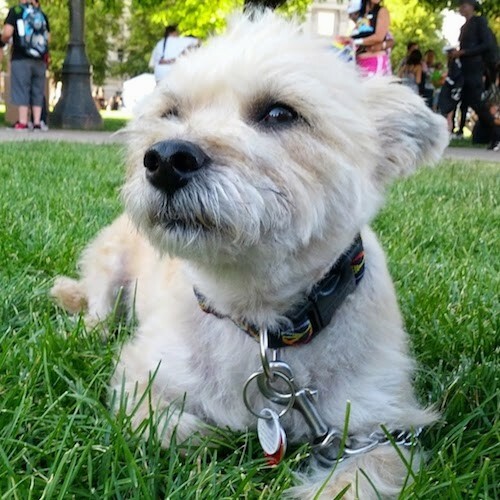 It is a cross between the Cairn Terrier and the Bichon Frise. The best way to determine the temperament of a mixed breed is to look up all breeds in the cross and know you can get any combination of any of the characteristics found in either breed. Not all of these designer hybrid dogs being bred are 50% purebred to 50% purebred. It is very common for breeders to breed multi-generation crosses. "This is Maximus Pawnelius or Max for short. 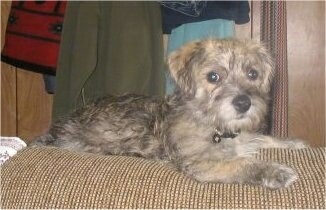 He's a six-month-old Cairn Terrier / Bichon Frise cross (Kashon). When I took this photo he had just woken up from a very long nap and was not pleased to be awake." 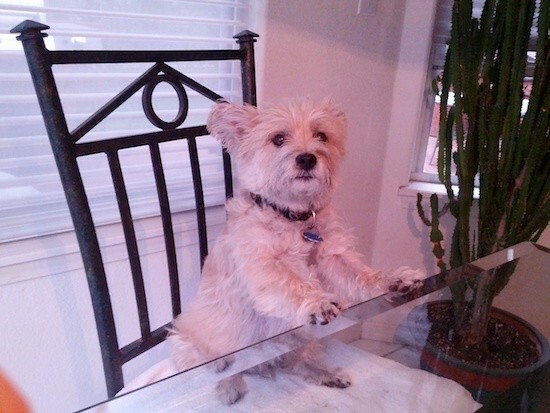 "Nikko the Kashon Terrier thinking he is a person at the table. Don’t ever put a dog door near your kitchen table next to the dog bowl and his water. Not a good idea!!" 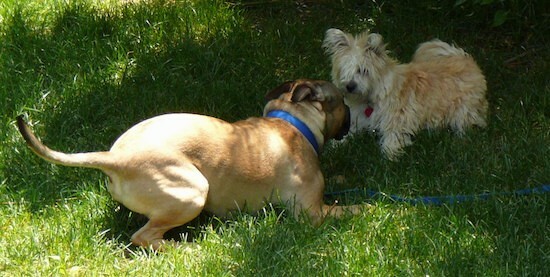 Nikko the Kashon Terrier at 6 years old having fun playing with his Boxer friend.